You don’t have to care and tend to your own flourishing organic garden to enjoy the copious gifts of summer, because, let’s face it, growing a perfectly luscious tomato is actually pretty hard work! But we all love to eat tomatoes, heirloom varieties and all, so when you really want to bake with this fleshy fruit, it is wonderful to get out and support local growers at a farmers market as you will find the most flavorful specimens there. Eating in season isn’t always easy, though the summer months have us covered with everything from yellow peppers to beet leaves, green onions to carrot tops and of course, the ever-growing zucchini. You know that you can add 2 cups of shredded zucchini to flourless brownies, right?! If you haven’t tried this amazing dessert yet, here is your chance, just be sure to pick up an extra large zucchini, or several small ones, so that there will be leftovers… And while you are out shopping for fresh garden ingredients, you may also want to grab an extra eggplant, after all, a grilled eggplant and sun-dried tomato salad is also in season. Now, that we have digressed so far from those ripe tomatoes, it is time to get back to the baking dish and slide it into the oven at 350 F. Bake for 25 minutes and dinner is ready to be served with your choice of protein on the side. Combine the chopped tomatoes, olive oil, herbs and seasoning; mix well. 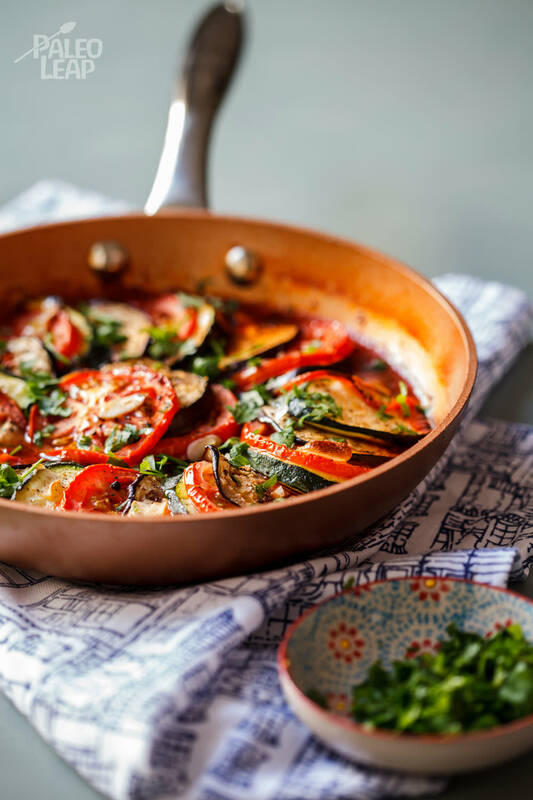 Pour seasoned tomato mixture into the bottom of an oven-proof dish. Place the vegetables in the dish and top with garlic and a pinch of salt and pepper. Place in the oven and allow to bake for 25 minutes. Remove and sprinkle with the chopped parsley.